Copycat Cheesecake Factory BBQ Ranch Chicken Salad - Let the Baking Begin! Last week my husband called me from work and offered to go for dinner to Cheesecake Factory. It’s kind of a drive from where we live, but we absolutely love their BBQ Ranch Chicken Salad, so sometimes we make the drive just for that. 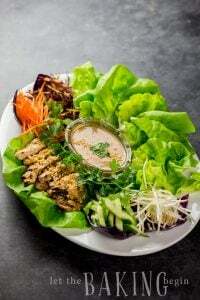 We usually order one chicken salad and split it between the two of us and our daughter (their portions are HUGE) and then share one entrée. But no matter what we order for an entrée we must have this salad first. Somehow the fresh lettuce, tomatoes, corn, beans, the avocado and the BBQ chicken all tossed together with the creamy BBQ dressing just works so amazing that if there was no one around we would probably lick our plates clean. Unfortunately, not soon after the initial call my husband called me again canceling due to work. I was really looking forward to that salad. 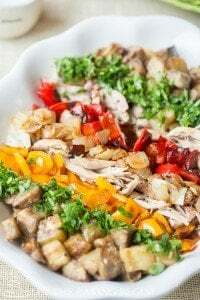 Determined to have the salad no matter what, I opened my fridge scanned it for the right ingredients, then went to my pantry got a couple of cans and decided to make my own copycat recipe BBQ Chicken Salad Recipe at home. It turned out so good that we made it a couple more times after that. Chop the romaine lettuce, green onion, and the tomatoes. Stir all the ingredients for the BBQ Dressing together. For the best visual presentation, place the chopped lettuce on the bottom of the bowl, then place the chopped chicken (you can toss it with some BBQ sauce before putting on top of the salad), beans, corn & the tomatoes in 4 mounts. Split half an avocado into 4 sections lengthwise, peel the skin off and discard it. Put 1 piece of avocado between each section. Next put the chopped scallions in the center between the 4 mounts. 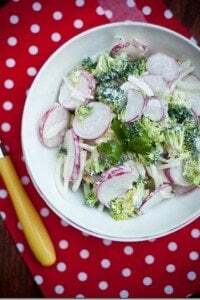 Drizzle dressing all over the salad. Stir everything together before eating. Check for seasoning and add more salt if needed. Knowing that my sister loves this salad just as much, I made a bowl and sent it up to her house (she lives almost next door). Couple minutes later she texted me asking if this was leftovers from Cheesecake Factory or did I really make that avocado chicken salad myself. Her thinking that it tasted exactly like theirs was when I knew I made the perfect copycat recipe!! Creamy Tomato Basil Salad – The perfect tomato salad! 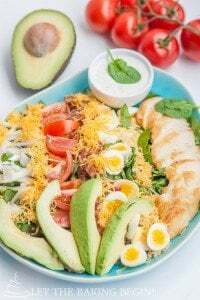 Cobb Salad – Romaine, spinach, chicken, tomatoes, eggs, avocado, and bacon!! Broccoli Chicken Salad – Bacon, broccoli, and craisins! Copycat Cheesecake Factory BBQ Ranch Chicken Salad is a colorful salad with Romaine lettuce, tomatoes, corn, avocados, beans, chicken and a BBQ Ranch dressing that brings this chicken salad recipe altogether. ½ cup chopped green onion not pictured. Stir all the ingredients for the dressing together. For best visual presentation, place the chopped lettuce on the bottom of the bowl, then place the grilled chopped chicken (you can toss it with some BBQ sauce before putting on top of the salad), beans, corn & the tomatoes in 4 mounts. Split-half an avocado into 4 sections lengthwise, peel the skin off and discard it. Put 1 piece of avocado between each section. Next put the chopped scallions in the center between the 4 mounts. Drizzle dressing all over the salad. Stir everything together before eating. Check for seasoning and add more salt if needed. I realy love these recipes. I am surely going to give a try. It looks so delicious and so easy to make. Thanks Kendrick! Hope you enjoy it! Hi, the recipe sounds wonderful. But it would of been great to see a picture of the finished dish. The last picture of the post is the picture of the finished dish 🙂 You mix it at the table right before you eat it. Forgot to mention-I add Durkee onion rings on top to give it a crispness and to make it more like Cheessecake Factory’s recipe. Yummy! I made this the other night and we loved it! My hubby requested it again today so I will be making it for dinner. 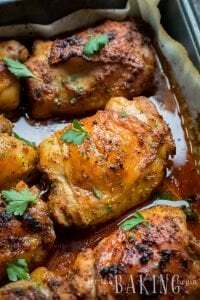 I will be trying it with pinto beans today instead of black beans.. and for the chicken we season it with johnny salt and mix in some mayo and grill it adding some bbq sauce on it afterwards. Thanks for such a great recipe! Hi Valentina, I’m happy to hear that your husband liked this salad 🙂 BBQing chicken sounds like a great idea! Made this for dinner tonight and my family loved it. I think my favorite part was the dressing! Thanks for a great recipe! Thank you Laura! My husband loves the dressing in this one the most too! That salad looks absolutely scrumptious! Definitely something I need to try at home. By the way if you ever have another craving for a BBQ chicken salad, Panera Bread also has a fabulous one. Thanks for the lead Lana! I was at Panera’s bread only once (the closest one to me is at the mall and I don’t visit the mall very often) and whatever I had there was really good, so I trust that if they have a BBQ chicken salad it also must be good. I’ll be at the mall tomorrow… hmmm..
Wow Marina! Looking at this salad is making me drool!!! I’m totally making it tomorrow for dinner or lunch or maybe both! My hubby is not a big fan of Cheesecake Factory so I’ve never had that salad. Maybe we gotta give it another chance;) thank you for sharing your awesome creations! Btw hour cakes are gorgeous! Thank you Natasha, you’re very sweet!